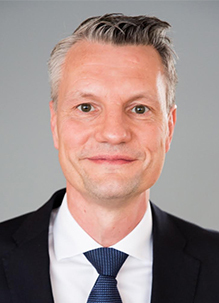 Dr. Marc Opresnik is a distinguished professor of Marketing and a member of the Board of Directors at SGMI Management Institute St. Gallen in Switzerland, a leading international business school. He is President of Opresnik Management Consulting. Dr. Opresnik is a professor of Business Economics, in particular Marketing and Management at the Luebeck University of Applied Sciences and a visiting professor to other international universities such as the East China University of Science and Technology (ECUST) in Shanghai and European Business School in London. He is the author of numerous articles and management books, including the internationally acclaimed marketing principles text “Marketing – A Relationship Perspective.” Along with Kevin Keller and Philip Kotler, the world’s most renowned marketing professor, he is co-author of the German edition of “Marketing Management”, the “bible of marketing.” His latest book is Social Media Marketing: A Practitioner Guide, co-authored with Philip Kotler and Svend Hollensen. What made you write this book at this time? My co-authors Philip Kotler, Svend Hollensen and I felt that there are not many books on social media marketing which focus on the operational aspect of this subject area. Instead many books just look at the strategic aspects but neglect to take the important operational aspect into consideration. 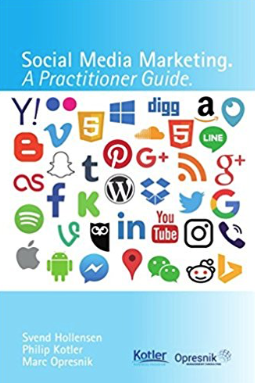 Consequently, our book on ‘Social Media Marketing’ is subtitled “A Practitioner Guide” as it guides the marketer through the maze of communities, platforms, and social media tools so that they can decide which ones to use, and how to use them most effectively. With an objective approach and clear, straightforward language, it shows how to plan and implement campaigns intelligently, and then measure results and track return on investment – all written in a concise and easy to understand manner. In addition, we decided to publish the book via Amazon in order to be able to update it every quarter given the dynamic nature of the topic. How do companies make social media part of their conversation with the market? What is social media marketing planning? Every company and organization should do social media planning and specify actions, goals and platform strategies in a specific social media marketing plan which is the summary of everything the company plans to do in social media marketing and hopes to achieve for the business using social networks. This plan should include an audit of where the customers are today, goals for where you want them to be soon, and all the social media tools that the company wants to use to get there. How should companies audit their social media marketing initiatives? Prior to creating your social media marketing plan, the company needs to assess their current social media use and how it is working. This means figuring out who is currently connecting with the company and its brand via social media, which social media sites the company target market uses, and how the social media presence compares to the competitors. Once the audit is conducted the company should have a clear picture of every social media platform representing the business, who runs or controls them, and what purpose they serve. This audit should be maintained regularly, especially as the company scales up its business. It should also be evident which social media platforms (accounts) need to be updated and which need to be deleted altogether. If the audit uncovers for example a fake branded Twitter profile, it should be reported. Reporting fake accounts will help ensure that people searching for the company online only connect with the accounts that are managed by the company itself. As part of the social media audit the company may also want to create mission statements for each social media platform (network). These one-sentence declarations will help to focus on a very specific objective for Instagram, Facebook, or any other social media network. They will guide actions and help to stay on track if performance begins to lag. Before it is possible to determine which social media platforms are right for the business, the company should find out who the audience is for each platform and what they want. The company should know which tools to use to gather demographic and behavioral data, and how to target the customers it wants. Can you tell us about your theory of “bowling to pinball” model and how you have extended it in the book? The metaphor of “bowling to pinball” was first introduced by Hennig-Thurau et. al. in the article “The Impact of New Media on Customer Relationships” published in 2010 in Journal of Service Research (13, 3, pp. 311–30). Although a little oversimplified, marketing in the pre-social media era was comparable to ‘bowling’. A game of bowling shows how you may have traditionally communicated with your consumers, with the firm and the brand (the bowler) rolling a ball (the brand communication message) towards the pins (our target customers). Clearly this is a very direct one-way communication approach. This is the old traditional push model. Marketers targeted certain customer groups and sent out their advertising messages like precisely bowled bowling balls. They used traditional media to hit as many bowling pins as possible. One key characteristic of this bowling marketing game was the large amount of control the company retained over marketing communication because consumers were given only limited freedom of action. For many bigger companies a large TV-budget has been the ball that marketers rolled down the lane, trying to hit as many pins as possible. Marketers were in control, happily counting how many ‘pins’ they had hit, and how often. Success in this game was clear-cut, and the metrics clear. In a social media marketing world, the bowling metaphor does not fit anymore. On this arena, marketing can be better described as playing ‘Pinball’: Companies serve up a ‘marketing ball’ (brands and brand-building messages) into a dynamic and chaotic market environment. The ‘marketing ball’ is then diverted and often accelerated by social media ‘bumpers’, which change the ball’s course in chaotic ways. After the marketing ball is in play, marketing managers may continue to guide it with agile use of the ‘flippers’ but the ball does not always go where it is intended to. Consequently, in the ‘pinball’ world, you cannot know outcomes in advance. Instead, marketers have to be prepared to respond in real time to the spin put on the ball by consumers. When mastered well, the pinball game can deliver big point multipliers, and if the company is very good, even more balls can be shot into the game. A reason for this may be that today consumers have a large audience to bring up new topics on the communication agenda. In the ideal situation, you are reaching networked influencers, advocates, and other high-value consumers, who may sustain and spread positive conversations about the brand across multiple channels. Occasionally, the marketing ball will come back to the company. At this point, the firm (brand) has to use the flippers to interact and throw it back into the social media sphere. If the company or the brand do not feed the social marketing media sphere by flipping communications back, the ball will finally drop through the flippers and on longer term, the two-way relationship between consumers and the firm (brand) will die. The Traditional one-way advertising (mass media advertising like television advertising, newspaper / magazine advertising etc.) represents the ‘bowling’ approach where the firm attempts to ‘hit’ as many customers with ‘shotgun’ mass media methods. Normally this approach is a one-way communication type. 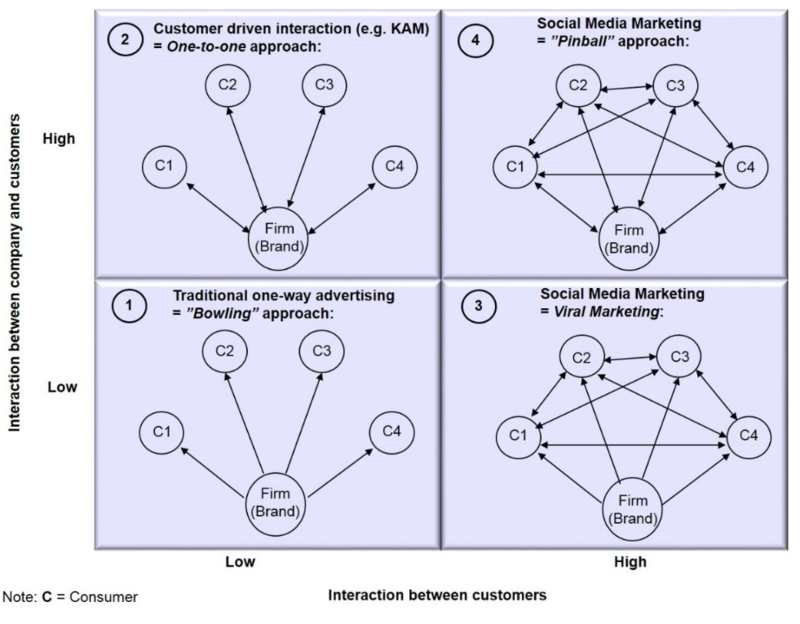 Customer-driven interaction represents a higher degree of interaction between the company and its different key customers. Often the company finds some Key Account managers, who have the responsibility of taking care of the one-to-one interaction between the firm and its key accounts (customers). Viral Marketing is representing the version 1.0 of Social Media Marketing, where the company e.g. uses an untraditional YouTube video to get attention and awareness about its brand. The interaction between the potential ‘customers’ is quite high (blogging sites etc. ), but the feedback to the company is relatively low (no double arrows back to the company). Social Media Marketing is representing the version 2.0 of Social Media Marketing, where there is also an extensive feed-back to the company itself (double arrows back to the company). Here the company proactively has chosen to be a co-player in the discussion and blogging on the different relevant social media sites (Facebook, Twitter etc.). This also means that the company here tries to strengthen the interaction with the customers in a positive direction, in order to influence the customer behavior. To do so, the company needs a back-up team of social media employees who can interact and communicate on-line with potential and actual customers. Consequently, this strategy is also very resource demanding. Company and Content: The 6C model begins with the company and the content it creates. Basically, the Internet remains a ‘pull’ medium, in the way that firms seek to pull viewers to its content, and finally to the company itself. However, before any ‘pull’ can happen, the content has to be pushed (seeded) forward in the chain. Content can take the form of e.g. a Facebook product or brand page, and/or a YouTube video pushed out to viewers. Control: At some moment, the company hands over control of its brand to the online community and the customers. To accelerate the viral uptake of its brand messaging, the company sometimes gives up the digital rights and blocks in order to encourage online community members to copy, modify, repost, and forward the content. The content is intended to be copied and/or embedded into people’s websites, blogs, and on Facebook walls. The key point to this stage in the process is that the company (the content creator) must be willing, and even embrace, the fact that they no longer have full control over the content: it is free to be taken, modified, commented on, and otherwise appropriated by the community of interest. Community: The company creates content and pushes it over the symbolic border of control (like stated above) to the other side, where a community of interested consumers now takes it up. At this point, communication becomes bidirectional. Customers and Conversations: The ultimate expression of engagement occurs when a multitude of online conversations circle around the phenomenon and content. The 6C model distinguishes between the online community and potential customers, as the latter are usually a subset of the former. The online community may also include people who have heard of the Web-based initiative but not directly participated in it. 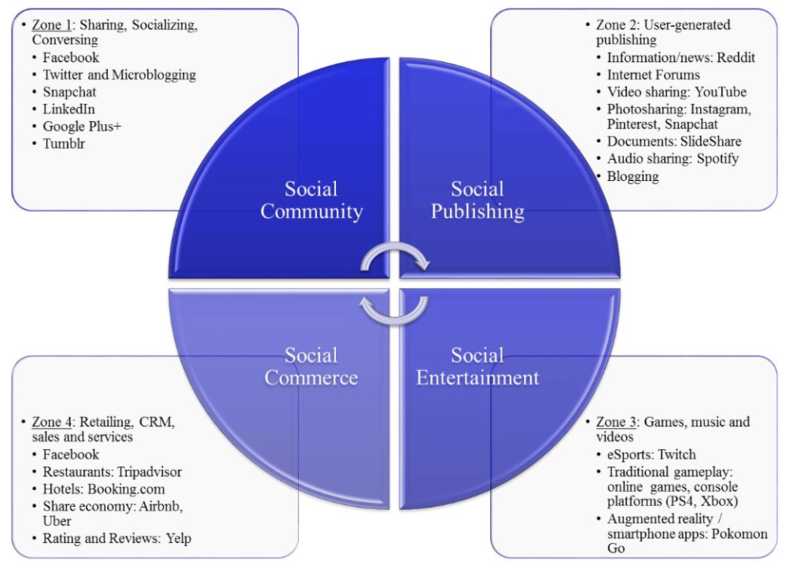 Can you explain the four zones of social media? Zone 1: Social Community describe channels of social media focused on social relationships and the common activities people participate in with others who share the same interest. Thus, social communities feature two-way and multi-way communication, conversation, collaboration, and the sharing of experiences and resources. Zone 2: Social Publishing sites help dissemination of content to an audience. The channels of social publishing include blogs, micro sharing sites, media sharing sites, and social bookmarking and news sites. Zone 3: Social Entertainment encompasses channels and vehicles that offer opportunities for play and entertainment. These include socially enabled console games, social games and gaming sites, and entertainment communities. Zone 4: Social Commerce refers to the use of social media to assist in the online buying and selling of products and services. It is a subset of e-commerce, which is the practice of buying and selling products and services by the internet. How should a company or an individual select the different social media channels they should participate in? Once you’ve finished with your social media audit, it is time to choose the online presence. Choose which networks best meet the company’s social media missions and objectives. If there is not already a social media profile on each network/platform the company focuses on, it should build them from the ground up with the broader mission and audience in mind. Each social network has a unique audience and should be treated differently. If the company has some existing platforms, it is time to update and refine them to get the best possible results. Optimizing profiles for SEO (Search Engine Optimization) can help to generate more web traffic to the company’s online social media platforms. Cross-promoting social platforms can extend the reach of content. In general, social media profiles should be filled out completely, and images and text should be optimized for the social network in question. How do companies measure the results of social media marketing? Marketers are being overwhelmed with social media activities but there is little consensus on what one should be measuring. This section attempts to bring clarity to the situation by viewing social media metrics from the lens of integrated marketing communications. Marketing communication metrics are necessary for the development and evaluation of marketing programs. In social media marketing, there are special challenges in choosing the right marketing metrics. The company has to choose the social media metrics that are most informative to the marketer, in relation to achieving above communication objectives. In general, the list of metrics differentiates between non-financial and financial metrics. It is advisable in any case to track social media marketing performance by applying a comprehensive set of metrics, both financial and non-financial ones such as Volume of Mentions, Share of Voice (SoV), Click-through Rate (CTR), Return on Investment (ROI), Cost-per-Click (CPC) – (or Pay-per Click) to name a few.